Something's fishy with this chicken noodle soup! 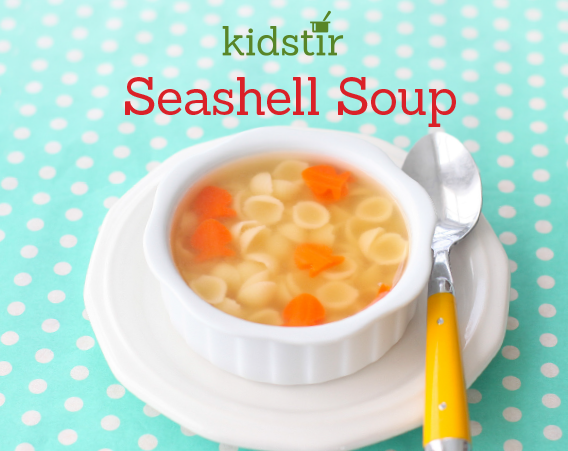 It's made with chicken broth, shell pasta, and carrot goldfish or starfish. You can cut the carrots into goldfish shapes with the cookie cutters in your Snack Happy kit or into starfish shapes with the cookie cutters in your Winter Wonderland kit. 1. Pour the broth into the saucepan. Bring it to a low boil over medium-high heat. 2. Peel and cut the carrots into long, diagonal, thin strips. Use a cookie cutter to cut out the carrots. 3. Carefully add the pasta shells and carrot fish to the hot broth. Cook for 10 minutes. In the last minute, add the diced chicken, if you'd like. 4. Ladle the soup into bowls and enjoy!